Royal Selangor in Kuala Lumpur is Malaysia’s most famous brand in pewter crafting and is also globally known for its beautiful designs. At Royal Selangor Pewter Factory and Visitor Centre, visitors can witness first-hand the work of art that is pewter crafting, as well as learn about the company’s rich history and the spectacular works of art. At the visitor centre, guided tours are complimentary and come in many languages (English, Malay, Japanese and Chinese). Visitors will be brought back to the historical Royal Selangor, founded in 1885, and follows the story of Yong Koon in the set up of the company. Here, visitors will be brought to the museum that features Yong Koon’s original working tools and personal items. Along the tour are pewter carvings of significant importance, such as the carving of the numbers 1885, symbolizing the year that Yong Koon began his business, and the Touchmark, the 4 Chinese characters that are 2.4 metre high each. Next, visitors will be greeted by a showcase of pewter craft in various forms namely; a giant weighing scale, chimes, wall finishes, a hall of photo frames and hand prints. There is also an archive display on Comyns, a British silver brand that was bought over by Royal Selangor in 1993, with displays of many old and luxurious silverwares. Proceeding further, visitors will get to explore the scientific properties of pewter, before stopping by the actual factory, where packaging and shipment to over more than 20 countries are done. The final part of the tour brings visitors to witness live pewter craftsmanship, showing how pewter is casted, filled, polished, soldered and hammered before becoming a work of art. Interested visitors can also purchase pewter crafts as souvenirs. Royal Selangor is one of the best known Malaysian brands in the world and knowing how its products are made is definitely knowledge to be proud of. 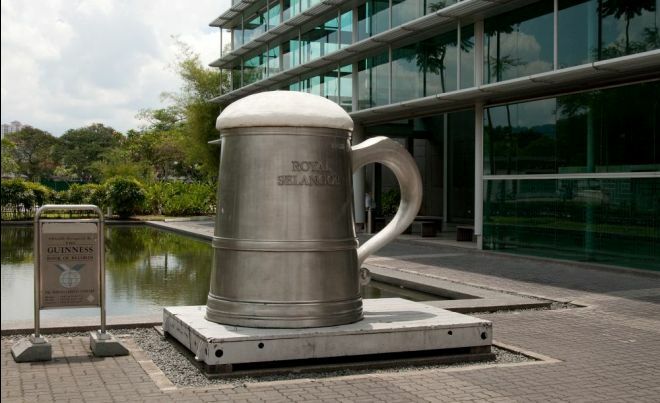 Royal Selangor Pewter Factory is located at Setapak, Kuala Lumpur, just 20 minutes drive from the city centre. Royal Selangor Pewter Factory opens daily from 9am to 5pm and entry is free.